So here's a review that I wrote a while back when I attended Thomas with a small group. On March 13 we went back to Thomas with the whole foodies crew and unfortunately had a much different experience, which is documented below the original. Lately I feel there has been a shift to Asian cuisine in the eclectic neighborhood of 39th street. To tell you the truth, I don’t mind it at all. I love authentic noodle dishes from Po’s, the basil fried rice from Thai Garden, and I may partake in a little bit of Blue Koi sometimes. But this little blurb isn’t dedicated to any of the wonderful asian restaurants, but more to a locally owned, fundamentally amazing restaurant called “Thomas.” The menu at Thomas offers a beautiful take on traditional American cuisine, and the environment of the dining room gives me the feel of a small east coast eatery. We started the meal off with some bruschetta and made our way through a beautiful green salad. For our entrée we chose the Diablo Pasta with a seafood medley mixed in. The seafood was cooked to perfection and the slight spiciness of the pasta gave a real attitude to the meal. The proportions of the pasta were perfect and the sauce was light yet packed with amazing flavor. The staff and owner are also very friendly and always looking for ways to make your experience a better one. We ended up speaking with the owner for about 30 minutes on the KC restaurant scene and how he got started with the idea for Thomas. Back to the meal!! For drinks we went with an Argentinean flight and a couple glasses of pinot noir. The culmination of the wine, food and ambiance was even further intriguing with the added element of the piano player Vince Cook. He has a booklet loaded with 100's of songs he covers, and thus, there’s a never ending mix to your dining experience. In one night we heard everything from Beatles covers to Bittersweet Symphony. 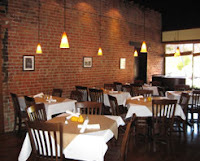 Overall, Thomas is an excellent environment to bring some friends or a date. The pricing of the menu is very decent and the wine/martini selection is impressive as well. Go down to 39th street, strike a conversation with Vince, and indulge in an amazing experience. Ok. So our foodies adventure to Thomas began with pure excitement, especially after I hyped up my last visit. First off, we made a reservation at 8:30 for ten people, and were given a table that fit eight at most in the corner of the restaurant. Not that this is a huge deal, I can sit close to my friends, but its unfortunate that we made the reservation almost two days before our actual visit. We started off the night with an interesting mix of wine bottles and various martinis, all of which were excellently prepared and extremely tasty. What was not excellently prepared or tasteful was the service we got. Now we know perfectly well that the food service industry is about the most difficult out of all other industries, especially when there's a ten top sitting in a corner booth. Well this server was just not having a good day and it was reflected in his behavior towards not only our questions, but concerns with the food preparation. Having vegetarians in the mix one must be able to probe the meals to make sure they fit their lifestyle and habits, and this was the last thing the server was willing to do. So the night started off with good drinks that eventually went sour when the food came. Just as I expected, the food was excellently prepared and wonderful from start to finish, but we kept feeling the wrath of bad service. You know that feeling that you want to leave because you don't feel welcome? Yeah, that was the emotion lingering in the air for the entire night. By the end of the night I had to apologize to our entire group for promising them something that didn't pan out like I thought it would. I really do believe in the Thomas menu and drink lists, but I need more consistency. My first visit there was welcomed by an extremely polite and helpful waitress, even a conversation with the owner and piano player, but this visit was kind of a letdown. I don't know if I'll be able to go back unless there's something that really pushes me past the whole "not feeling welcome" taste I have in my mouth. But with The KC Foodies we never give up on a restaurant. Sometimes a second chance is needed for a bad experience, and we're always willing to give Thomas another try, but probably not until the summer.